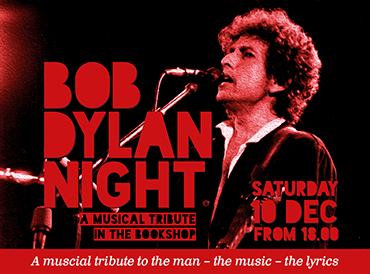 Open reading of Bob Dylan’s lyrics at The English Bookshop in Uppsala. What do the works of this year’s literary Nobel laureate sound like without the music? Sam Kessel leads the proceedings. Also Open Mic, so bring your favourite Dylan lyrics. Free entrance. A very special musical tribute to the literature laureate in the Stockholm bookshop. Personal musical interpretations of Dylan songs by musicians Jan Hammarlund, Katarina Gunnerholm, Hélène Bohman Blomqvist, Maria Lindström, the band Gränsen, and a special guest appearance. The event is in English, but the language of music is universal. With the words "that epicist of the female experience, who with scepticism, fire and visionary power has subjected a divided civilisation to scrutiny", Doris Lessing is awarded.